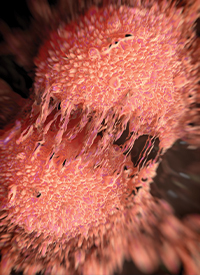 The NCCN now lists apalutamide (Erleada) as a category 1 recommendation for the treatment of patients with nonmetastatic castration-resistant prostate cancer (CRPC). In treatment guidelines issued March 8, 2018, the NCCN included the next-generation androgen receptor inhibitor as a treatment option for patients with M0 disease, especially in those for whom PSA doubling time is ≤10 months. The FDA approved apalutamide in February 2018 for the treatment of patients with nonmetastatic CRPC. The approval was based on results from the international, placebo-controlled randomized, phase III SPARTAN trial in which apalutamide reduced the risk of metastasis or death by 72% in patients with nonmetastatic CRPC. The median metastasis-free survival (MFS) was 40.5 months in the apalutamide arm versus 16.2 months in the placebo arm (HR, 0.28; 95% CI, 0.23-0.35; P <.0001). SPARTAN evaluated the safety and efficacy of apalutamide versus placebo in 1207 patients with nonmetastatic CRPC and a rapidly rising prostate specific antigen (PSA) level despite receiving continuous androgen deprivation therapy. Nonmetastatic status was determined by a negative bone scan, as well as a negative CT of the pelvis, abdomen, chest, and brain. Patients were required to have a PSA doubling time of ≤10 months, as evidence has shown that these are the patients most at risk for developing metastases and death. Patients were randomly assigned to 240 mg of apalutamide daily (n = 806) or placebo (n = 401) from October 2013 to December 2016. The clinical cutoff date for the primary analysis was May 19, 2017. The average baseline PSA doubling time was less than 5 months in both arms. Patients who developed metastases were allowed to receive abiraterone acetate (Zytiga) plus prednisone. Beyond the primary MFS endpoint, secondary endpoints included time to metastasis, progression-free survival (PFS), time to symptomatic progression, and overall survival (OS). For patients who developed metastases, the researchers also evaluated the time between randomization to first treatment for metastatic CRPC and subsequent progression (PFS2). The median time to metastasis was 40.5 months in the apalutamide arm compared with 16.6 months for placebo (HR, 0.27; 95% CI, 0.22-0.34; P <.001) and the median PFS was 40.5 months compared with 14.7 months for placebo (HR, 0.29; 95% CI, 0.24-0.36; P <.001). In an exploratory analysis conducted 12 weeks after randomization, the median PSA level had decreased by 89.7% in the apalutamide group and increased by 40.2% in the placebo group. Patient-reported outcomes indicated that patients who received apalutamide in addition to androgen-deprivation therapy maintained stable overall health-related quality of life over time, as did patients in the placebo group. Adverse events led to discontinuation in 10.6% and 7.0% of the apalutamide and control arms, respectively. Neither group had a reduction in mean baseline health-related quality-of-life scores as the trial progressed, and there was no difference over time in the scores between the groups. Among patients who discontinued treatment, 52.5% in the apalutamide group and 77.8% in the placebo group received subsequent approved treatment for metastatic CRPC. The most common subsequent treatment was abiraterone acetate (Zytiga) plus prednisone, which was administered in 75.8% of the patients in the apalutamide group and in 74.2% of those in the placebo group. The median time from the detection of distant metastasis to the initiation of subsequent therapy was 56 days in the apalutamide group and 44 days in the placebo group, and PFS2 significantly favored apalutamide (HR, 0.49; 95% CI, 0.36-0.66). Patients assigned to the study drug were more likely to experience grade 3/4 adverse events (AEs; 45.1% vs 34.2%). The rate of serious AEs was slightly higher with apalutamide (24.8% vs 23.1%). Ten patients in the apalutamide group and 1 in the placebo group died due to AEs. Smith MR, Saad F, Chowdhury S, et al. Apalutamide treatment and metastasis-free survival in prostate cancer [published online February 8, 2018]. New Engl J Med. doi: 10.1056/NEJMoa1715546.